Looking for a way to raise awareness about the siege of Gaza to a new audience? 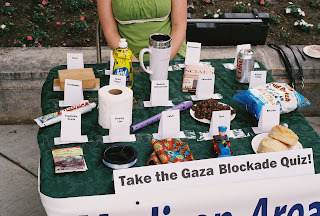 Cinnamon or cumin, chocolate or coffee, fishing line or toilet paper – which of these household items are allowed into Gaza under the Israeli blockade? 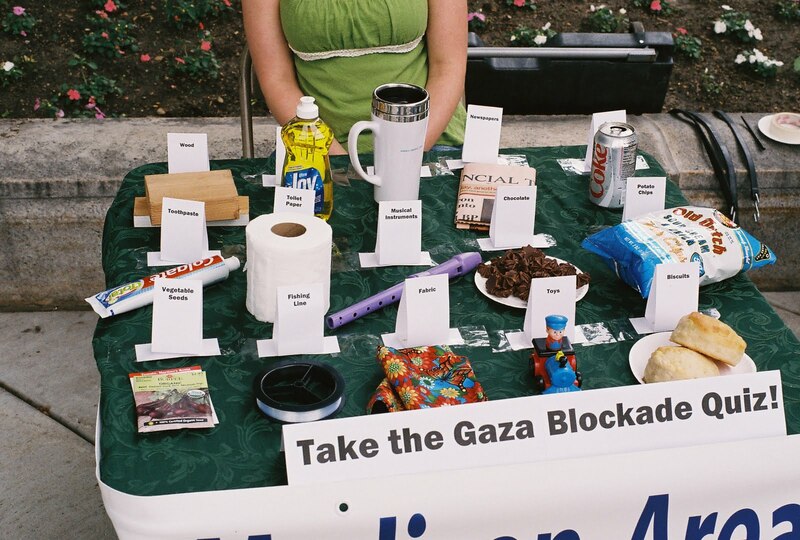 Shoppers at the Madison, Wisconsin farmers' market were challenged to test their knowledge by taking the “Gaza Blockade Quiz.” Each participant was asked to identify banned items from a table of everyday products. “This is a real eye-opener,” said one college student. Many contestants stayed after taking the quiz to discuss the Israeli-Palestinian conflict. Others gathered around to watch the game being played. This provided an opening to ask shoppers how they would get by without fabric or vegetable seeds or toys for their children. Many were shocked by the capricious nature of the Israeli blockade. Not one respondent thought the prohibited items could be legitimately classified as military contraband. Shoppers who would be hesitant to approach a table full of literature were intrigued by a table of everyday products. The interactive nature of a “quiz” also attracted attention. One unexpected benefit of including toys in the display was that kids flocked to the table, bringing their parents in tow. Setting up your own Gaza Blockade Quiz is easy. All you need is a card table, a few household items and labels made from note cards. Include a mix of banned and permitted products. The list of banned items is available from Gisha, an Israeli human rights organization (www.gisha.org). Be sure to suggest an action to be taken by contestants. Have them sign a petition to congress or hand out post cards addressed to your senators. Ordinary Americans have compassion for Palestinians when they identify with their predicament. Nothing provokes the righteous indignation of American consumers like a table of forbidden products!